On May 31st we saw the end of one of the best offers that we had seen for the RBC Visa Infinite Avion card, essentially it offered 25,000 points for free. That offer expired to be replaced by this one - the end result is the same but it takes a little bit more work. This time you can still get to 25,000 points and have the first year free but you'll have to put some spend on the card this time. 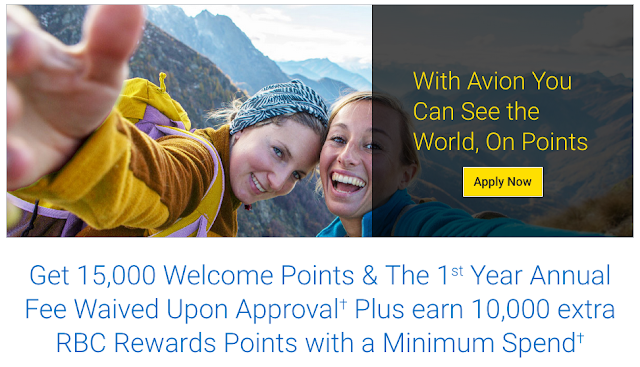 When approved you'll get 15,000 points then when you spend $1,000 on the card in the first three months you'll be awarded with 10,000 more points for 25,000 total - and the first year annual fee is waived. So technically speaking you are still getting the 25,000 points for free assuming the $1,000 in spending you put on the card is spending you would do otherwise. This is an easily achievable spend requirement only only $333.33 per month so if you missed out on the offer that ended in May this next one is as close as you'll get to it and still really good to take advantage of. This offer is slated to end on July 31, 2018.